The landings on the Moon (1969-1972) remain as one of the most "memorable" events of all times, they have been imprinted in our memory either in real-time or recorded, rendering them as one of the most recognizable non-personal experiences ever. Memory functions as an illusory vessel that conveys time back to the present; these images, which reside in the infinite index of mankind and belong to the territory of our collective remain intact, what has changed is the individual's perception since it probably has been altered with the passage of time. 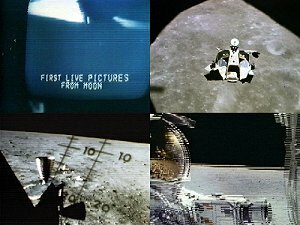 The fact that the authenticity and "realism" of the events has recently been in question, incited me to play with the original footage and create my own landing on the Moon. Monika Bravo was born in Bogota, Colombia in 1964. Since 1994 she has been living and working in Brooklyn, NY. In her work, she utilizes imagery, sound, industrial materials and technology to create illusions of recognizable landscapes and environments that examine the notion of space/time as a measure of reality. Her films, video installations and photographic work have been widely shown, recent solo shows include venues like Ciocca Arte Contemporanea in Milan, SITE Santa Fe in New Mexico, Mullerdechiara, Berlin and Dechiaragallery, NY, Tyler Gallery at Temple University in Philadelphia, Lehman Gallery at Lehman College in the Bronx. Numerous group shows at venues that include The New Museum of Contemporary Art and El Museo del Barrio in NY, Untitled Space in New Haven CT, Santa Fe Art Institute in New Mexico, Sala RG in Caracas, Museo de las Americas in San Juan de Puerto Rico, AboutStudio/AboutCafe in Bangkok and Espacio La Rebeca in Bogota. She has been a recipient of the Electronic Media & Film Award from the New York State Council on the Arts, both in 2000 & 2002 and has been part of art-in-residency programs at the Santa Fe Art Institute in New Mexico and the LMCC World Views at the World Trade Center.